Since their discovery, microRNAs (miRNAs) have emerged as crucial regulators of important cellular functions. 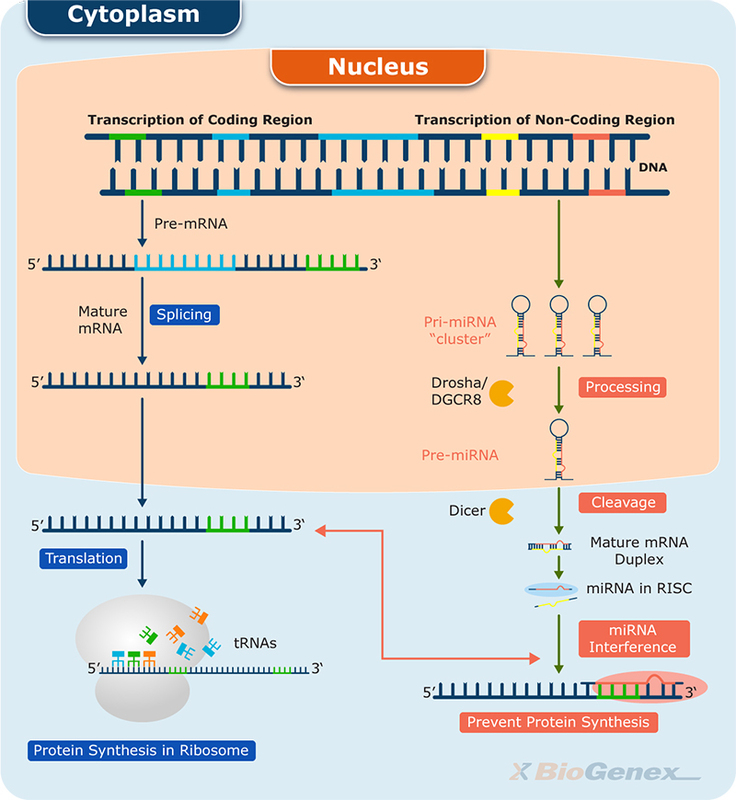 The biogenesis of miRNA follows a complex path through a number of precursor forms resulting in mature, small, noncoding, single-stranded RNAs that are typically 20 to 40 nucleotides in length (Figure 1)1. Mature miRNA binds to a specific target sequence within a mRNA effecting post-translational gene regulation of cellular processes such as development, differentiation, proliferation, metabolism, and apoptosis 1, 2. Dysregulated cell signaling in many tumor types results in upregulation or downregulation of various miRNAs. These microRNAs function either as oncogenes or tumor suppressors 3, 4. This dynamic role of miRNAs within various cell types gives them the potential to serve as promising biomarkers in diagnostic, prognostic and targeted therapy practices. Why miRNAs are required for cancer diagnosis? A major challenge in clinical diagnostics is to distinguish cancer types with poor differentiation. Poorly differentiated tumors exhibit very aggressive behavior and are difficult to treat due to poor prognosis. Many tumors are difficult to diagnose early on due to late-onset symptoms, overlapping immunohistochemical profiles, and indistinguishable histological characteristics. Also, the uncertainties surrounding the diagnosis of cancers of unknown primary (CUPs) can lead to significant psychosocial distress for both the patient and family 5. CUPs are metastatic tumors for which no primary site has been identified, accounting for 3–5% of all diagnosed cancers 5. The inability to identify the tissue of origin in CUP patients creates diagnostic challenges because the primary site of cancer determines the treatment choices and overall prognosis. However, increasing understanding of molecular alterations underlying carcinogenesis and cancer has created opportunities to use miRNAs as diagnostic and prognostic indicators. In the era of precision medicine, it is essential to identify novel diagnostic biomarkers to improve the management of cancer treatment and increased patient care. What are the advantages of using miRNAs in cancer diagnosis? The advantage of miRNAs lies in the ease of their detection and extreme specificity. Due to their small size, miRNAs are resistant to degradation and chemical modification in formalin-fixed paraffin-embedded (FFPE) tissues and correlate with expression levels in frozen tissues and body fluids, better than mRNAs 6. These properties make miRNAs as ideal non-invasive biomarkers and therapeutic targets for various cancer types and subtypes. What are the ideal methods for detection of miRNAs? Why in situ hybridization (ISH) is required for detection of miRNAs? Most methods to measure miRNAs require total RNA extraction which lacks critical spatial information and present challenges for standardization. However, in situ hybridization (ISH) in FFPE, allows precise detection and localization of specific nucleic acid sequences within a histological section, and preserves the anatomical structure of the fixed tissue 7, 8. This histological expression analysis is crucial for elucidating the role of miRNAs in molecular and biological processes. The underlying principle of ISH is that the nucleic acids within the histological specimen can be detected by the hybridization of a complementary nucleic acid probe with an attached reporter. Due to the high level of sensitivity, accuracy, and ability to differentiate between single nucleotide mismatches, miRNA-ISH has been accepted as a powerful technique in cancer diagnostics. What are the applications of miRNAs in cancer diagnostics? MicroRNAs are multifaceted and can be used for differentiation of malignant and benign tumors, early-stage cancer detection marker, identification of cancer of unknown primary (CUP), and differentiation of cancer subtypes 9, 10. miRNA expression profiles are also capable of grading, staging of cancer subtypes, and classifying undifferentiated and poorly differentiated tumors 11. Is getting the best miRNA-specific probe a burdensome work? BioGenex can help you! BioGenex has pioneered the development of miRNA research and diagnostics tools with leading-edge products. Currently, over 240 BioGenex ready-to-use (RTU) Super SensitiveTM Nucleic Acid (SSNA) miRNA ISH probes are available for accurate and early diagnosis of the tumor. These probes are sensitive enough to detect low-abundance miRNA(s), which is often required for biomarker discovery. They have a high melting temperature enabling stringent washes to remove non-specific binding. BioGenex miRNA probes are dual-end labeled with an anti-fluorophore to amplify the signal, and yielding a clean intense staining. miRNA specific probes and in situ hybridization Kit, developed by BioGenex, allow rapid, sensitive detection of miRNAs with high specificity while preserving tissue morphology. Each kit includes easy-to-follow protocols and ready-to-use (RTU) reagents. Due to high sensitivity and specificity of the probes, hybridization kits can be used for either manual or high-throughput automated staining. BioGenex SSNA miRNA probes combined with the automated processing using Xmatrx® platforms greatly increases the reliability of the test results through the elimination of error-prone ISH procedure. BioGenex fully-automated molecular pathology workstations are the most advanced system globally. Tan W, Liu B, Qu S, et al. MicroRNAs and cancer: Key paradigms in molecular therapy. Oncol Lett. 2018;15:2735-42. Lin S, Gregory RI. MicroRNA biogenesis pathways in cancer. Nat Rev Cancer. 2015;15:321-33. Svoronos AA, Engelman DM, Slack FJ. OncomiR or Tumor Suppressor? The Duplicity of MicroRNAs in Cancer. Cancer Res. 2016;76:3666-70. Fabbri M, Croce CM, Calin GA. MicroRNAs. Cancer J. 2008;14:1-6. Ferracin M, Pedriali M, Veronese A, et al. MicroRNA profiling for the identification of cancers with unknown primary tissue-of-origin. J Pathol. 2011;225:43-53. Szafranska AE, Davison TS, Shingara J, et al. Accurate molecular characterization of formalin-fixed, paraffin-embedded tissues by microRNA expression profiling. J Mol Diagn. 2008;10:415-23. Nielsen BS. MicroRNA in situ hybridization. Methods Mol Biol. 2012;822:67-84. Hanna JA, Wimberly H, Kumar S, et al. Quantitative analysis of microRNAs in tissue microarrays by in situ hybridization. Biotechniques. 2012;52:235-45. Kalra K, Xue L, Chang EE, et al. Expression of microRNA miR-205 in pulmonary squamous cell carcinoma and adenocarcinoma. Poster presented at United States and Canadian Academy of Pathology, 2013. Kalra K, Thakur S. In situ hybridization profiling of brain tumors showed differential expression of miR-10b, miR-96 and miR-146b. Poster presented at Annual Meeting of the Association for Molecular Patholgy 2015. Rosenfeld N, Aharonov R, Meiri E, et al. MicroRNAs accurately identify cancer tissue origin. Nat Biotechnol. 2008;26:462-9.